Authentic tapa cloth bra for Cook Islands/Rarotongan and Tahitian Dancers. THIS SAMPLE IT'S A KIDS SIZE BRA. OPTION-- please feel free to send me a message and i have no problem making this bra uniquely to your liking! Note--This listing is for children cups sizes and adults too. The coloring, sizing and sometimes the shape will vary. If you purchase this listing and provide me a size bigger than your size, I will not start your order until you've paid the difference of the size. All bra's can be made in any sizes, and all items will not look exactly the same as the picture, as i do hand make each item so they do tend to look slightly different, but not dramatically apart from the originals. Please note that these TAPA CLOTH not duplicated so TAPA CLOTH will vary from the picture but I do use tapa cloth that is similar to the picture. Authentic Tapa Cloth & Hau Grass Tahitian And Cook Islands Bra Top. Perfect For Girls Of All Ages! Authentic Tapa Cloth Bra Top. Perfect For Tahitian & Cook Islands/Rarotongans Dancers Of All Ages!! Soloist, Dancers, Luau. Authentic Tapa Cloth Bra For Children & Adult..Perfect For Tahitian And Cook Island/Rarotongan Dancers!! Covered Authentic Tapa Cloth Bra. 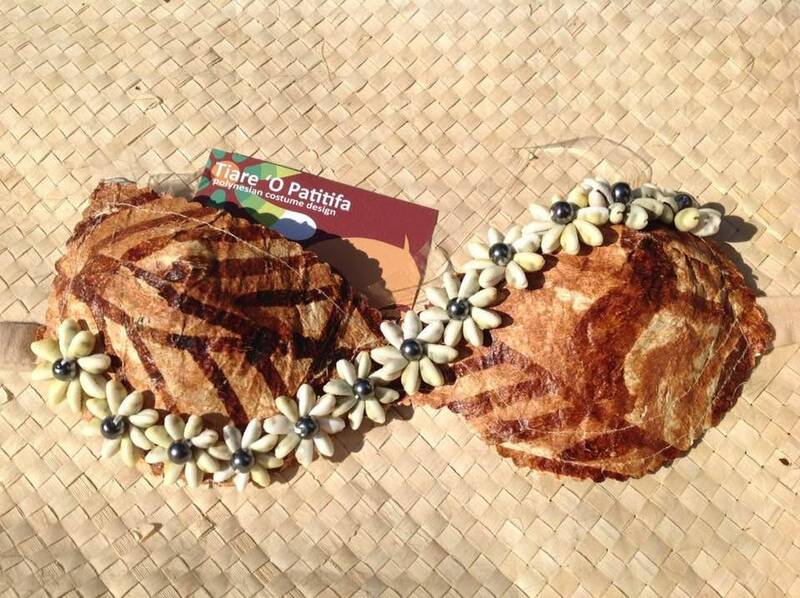 Tahitian & Cook Islands Costume Bra.. Authentic Tapa Cloth Covered Bra With A Tapa Cloth Flower. Perfect For Girls Of All Ages!! Authentic Tapa Cloth, Weaved Lauhala Bra Top. For Tahitian, Cook Islands, Rarotongan Dancers. Perfect For All Ages. Sample Is A Kids Bra!! SALE!! AUTHENTIC Tapa cloth pieces. 12" x 12" piece of tapa cloth only. Authentic Tapa Cloth Bra.. Tahitian & Cook Islands/Rarotongan Costume Bra. Perfect For Dancers Of All Ages.. Soloist, Groups, Luau. Authentic Tapa Cloth & Braided Coconut Fibers, Weaved Lauhala Bra. Tahitian And Rarotongan Bra. Perfect For Dancers Of All Ages, Soloist. Authentic Tapa Cloth Bra Top For Children And Adult. Tahitian And Cook Islands/Rarotongan Costume Bra. Perfect For All Ages! Luau, Soloist. Authentic Tapa Cloth Bra Top.. Perfect For Tahitian And Cook Islands, Rarotongan Dancers, Soloist, Luau, Pageant, And Groups Of All Ages!! Authentic Tapa Cloth With Coconut Fibers Bra. Perfect For Tahitian & Cook Islands Costume, Luau, Soloist Dancers, Dancers, Halau Or Groups. Simple Headpiece For Tahitian & Cook Islands Dancers. Authentic Tapa Cloth, Lauhala, Niau And Raffia. Perfect For Dancers Of All Ages! !